Feel free to use it in your own 7 Quick Takes posts if you’d like! I find it interesting that the two of the posts I wrote this week were some of the most popular ones in a while (the one about “hearing” answers to prayers and the one about the prank call with the Christian gone awry), and they were both the direct result of accidentally deleting my ideas list. It was really tempting to go buy some recovery software and spend tons of time and energy trying to get that file back — I was so upset when I first realized I’d lost it — but something told me that I was just supposed to let it go. Now I’m really glad I did. It’s almost like there’s something to that whole trusting God thing! By the way, if you haven’t scanned the comments to the post about “hearing” answers to prayers, I recommend that you do so. What an interesting, informative comment thread! OK…so..yeah, I was referring to 28 degrees while a lot of y’all were living in -28 degree weather. I used to live in North Dakota, where we occasionally saw temps in the -60’s, so I’m well aware that at 28 I should not feel too tempted to change my name to Jennifer Zhivago or anything. However, what you may not know is that the American Meteorological Society recommends that when calculating the temperature index to estimate the feel of the air outside, you must drop 20 degrees for EVERY FREAKING STINGING INSECT you have to put up with (it’s written in all caps, just like that). Hence, a low temp of 28 degrees + finding your child’s feet covered in fireants on the same day means that it was actually 8 degrees over here. Actually, make that -2 degrees — I’m subtracting another 10 because I’m sure there’s a scorpion around here somewhere that I just haven’t seen yet. I got the idea from this great list of quiet church toys to bring pipe cleaners to Mass to keep busy little hands occupied. I got some nice, big colored ones from Hobby Lobby, and I have to say that my kids have been fairly amused by them (I tell them to make something special for Jesus each time), and they’re wonderfully silent. As a thank-you to everyone who participates in 7 Quick Takes, I upgraded my Mr. Linky account, which means that all the links to everyone else’s Quick Takes posts will be visible indefinitely (the way it was set up, I could only display one Mr. Linky list at a time on my site so the links to your old Quick Takes posts weren’t visible after a new one was up). I hope that this helps everyone get a little more traffic from participating! Also, I can now export the lists to HTML, which helps with search engine and other webby rankings. Also, Kingdom Mama is nominated for Best Conservative Mommy Blogger. Her blog is definitely worthy of the title, but doesn’t she just automatically win since she has TWO sets of young twins and is pregnant with #5? Or maybe they have a special Lifetime Achievement category for superwomen like that. I slipped over here to offer my warmest congratulations on your nomination… and that I thought you should have the honors… Yeah, you and me both: keepin’ it real. Thanks Jen for another great week! My apologies, I couldn’t work out how to fix my linky mistake, hoping you can:) Really enjoyed this! I love your pipe cleaner idea for Mass – thanks for sharing. I loved the “hearing prayer” post. Writing about prayer is on my list of posts to write. Wiki stix are also very good. They are waxed string in different colors, used a lot by occupational therapists. They are clean and quiet and excellent for church or on an airplane, while waiting in a dr’s office, etc. I just saw an ad on TV for a similar product with a different name. My kids love them. I like the logo. It only took me twenty minutes to figure out how to put it in my post and make it link back to your site. Oh brother. But thanks for this meme. My handful of readers somehow find it interesting to read about the mundane things in my week. Cool logo. I’m too lazy to add it to this week’s post, though. Maybe next time. Or maybe next week I’ll be too busy packing to do a 7 Quick Takes. Looking forward to seeing you. THANK YOU for the quiet church toys link. Pipe cleaners – genius! I played along this week for the first time after enjoying yours so thoroughly. Thank you for hosting! Congrats on the nominations! Do they really say to lower the temperature for the bugs you feel? I’d have assumed bugs are a sign the temp isn’t low enough to kill them. Hearty little buggers. Those pipe cleaner animals are too, too cute! I bet that would keep little hands busy (and quiet) during church. Jen – the logo is darling! I’ve written some post and there has been some interesting debates take place in my comment sections. The comments are better then the post! It is funny how people will keep checking back at you blog to see what someone said about what they said. I agree hearing prayer post has helped me. I’m very new to this meditating and guiding my life. I’m a slow developer. I LOVE the new logo!! It’s awesome!! Now I’m off to write up my 7 quick takes for this week! I am so glad to know about the pipe cleaners! And that link is awesome! Thanks. I have to agree with you about your post on hearing God, and the comments. It was very, very helpful to sit and read them all (though it took me a couple of sittings – kept getting pulled away by the kids!). Thanks for hosting such good discussions. I think it says a lot about your writing, that it elicits that kind of conversation. Oh my! Look at all the links! I just giggle when I read your references to “Mr. Linky.” Your writing is always so intellectual and impressive, and “mister link-ee” sounds so funny. But he IS a cool guy after all. Thanks for the invite to join in! It’s a blessing to read your thoughts, and fun to hear the randomish things going on in other lives! Thanks so much for the mention! And I know there are a lot of awesome blogs, but yours will always be my fave! You are a constant source of inspiration. Or should I say, “He” is a constant source of inspiration! And you are so good at reminding us. BWAHAHAHA! “Make something special for Jesus.” *wiping tears* I’m going to have to find a way to say that to my kids this weekend. Girl, you crack me up. Love the new logo! Makes me want to participate just for that. 🙂 And that’s a great idea about pipe cleaners — I’ll have to remember that for when Sunshine is older. 28 degrees is cold to me! i’ve never lived anywhere colder and i hope i never do. I am really enjoying the 7 quick takes Jen. Thanks so much for hosting them. Great meme! Thanks for stopping by! I’ve been to your site a few times but I’m clueless how you found me too. LOL. 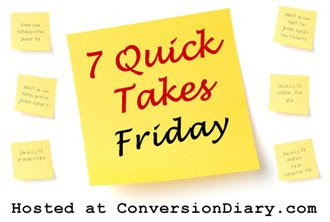 I did my first 7 Quick Takes today…I LOVE this idea! I’ve been reading yours for a while, but today was the first time A. I remembered it was Friday and B. had some computer time. Amy Jane at Untangling Tales pointed me over here a while ago, and I have really enjoyed reading. I have you on my Viigo on my BlackBerry. Thanks for hosting! Congrats on nom! Thanks for the logo — and for keeping me at the writing game at least once a week! Cute logo. The only thing that bugs me is I can’t quite read the mini post-its! (But I’ll get over it) I like what you said about letting go of the list, I’m bad at letting things go. It’s cool how it turned out to be so good! Congrats on the nomination! I loved your post about the telemarketer, very touching. Thanks! I’ve noticed many fellow bloggers participating and thought I’d give it a try. 28 degrees is bitterly cold in central Texas. and fire ants should be outlawed in any temperature. Sadly, I think they could live in any conditions. Mine too is up, very late, very late, but up! Happy Friday! Thank you for posting on prayer, its so encouraging to read the insights the holy Spirit has shared with each of us. Your blog is such a blessing!